Do you know whether your employer can access and analyze data from your wearable device? Will your insurer use your smartwatch data to price your premium? Will your data from your mobile health application be protected and secured from malevolent cybercriminals? These deal-breaking questions may result in a failure to deliver widespread health benefits if they remain unanswered. The guidelines follow the publication of an open-access, peer-reviewed commentary by colleagues at Vitality, Microsoft, and The Qualcomm Institute at the University of California, San Diego. This article called for a public consultation to identify best practices to eliminate ethical, legal, and social barriers to personalized health technologies. For 90 days between July and October 2015, a wide range of stakeholders offered input on a draft set of guidelines. Feedback came from organizations such as the EU Commission, the US Food and Drug Administration, the National Academy of Medicine, and the American Heart Association. Private sector companies also offered their input. Vitality and its partners seek to create a self-regulatory approach for the responsible innovation of personalized health technologies. 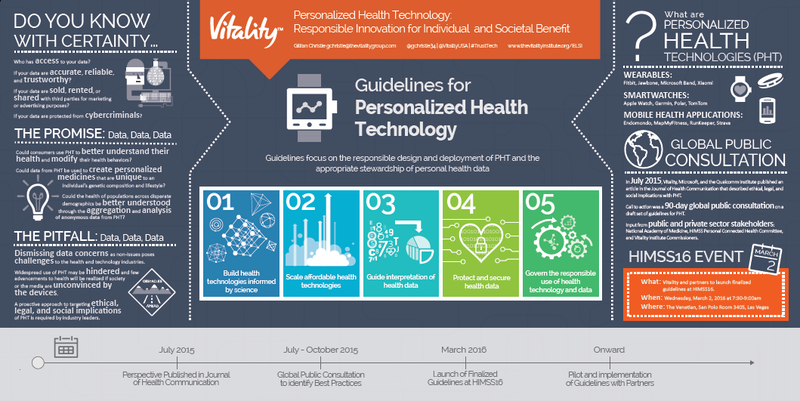 We call for the public and private sectors to join in partnership to pilot, implement, and report on the proposed guidelines for personalized health technology. The guidelines will be measured using tangible metrics, and results would be shared publicly in corporate reports. Collaborating across sectors, our proposed guidelines aim to shift the dialogue around personalized health technologies to promote shared values for all stakeholders. Next, Vitality will lead a working group focused on implementing the guidelines. The guidelines derive from the Vitality Institute Commission, which worked to close gaps in evidence and place prevention at the center of health policies and actions in the United States (US) between May 2013 and June 2014. One short-term measure of success proposed by the Commissioners was the creation of a framework that proactively addressed ethical, legal, and social issues with respect to the use of data collected by personal prevention technologies. The Commissioners contended that this be established through a systematic review and extensive public consultation, and adopted across sectors, by 2017. The vision for the personalized health technology guidelines is additionally informed by past achievements in proactive exploration of ethical, legal, and social concerns with the possession of genetic information. Twenty-five years ago, the Human Genome Project was founded as an international research collaboration to sequence human genes. The collection of sensitive genetic information spurred the early allocation of public funds to foster basic and applied research on related ethical, legal, and social implications. This research served to guide policy options regarding the appropriate use of genetic information. Today, established and accepted protocols facilitate the routine sharing of genetic data for research. The Guidelines for Personalized Health Technology were launched at breakfast event with selected invitees earlier today at the HIMSS annual conference in Las Vegas, NV. The infographic below will be presented at HIMSS as well. Are you interested in learning more about this initiative? Please contact Gillian Christie at gchristie@thevitalitygroup.com or on Twitter @VitalityUSA or @gchristie34.